In this event, several beautiful long stripes of fire are seen on the sea after nightfall. This beautiful scenery builds up a mood of quiet beauty, and it is part of the natural poetic charm of summer in Kominato. Before the TOHRO-NAGASHI, a memorial service is performed for each MIZU-TOHBA (water stupa) and TOHRO (Japanese lantern) on which words of prayers are written so that the spirits of the dead would response in peace. 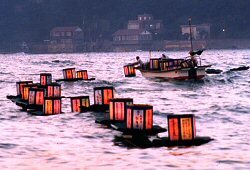 After the memorial service, the lanterns are cast afloat onto the sea of TAI-NO-URA (Bay of Sea Bream). 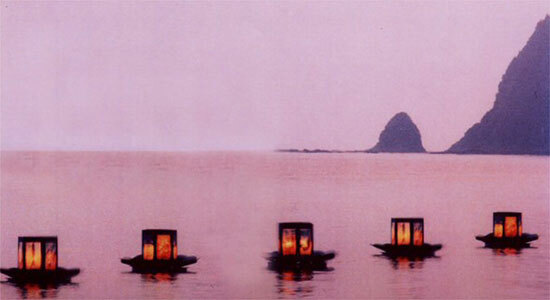 A large number of lanterns, which are loaded on four excursion boats of TAI-NO URA, are cast afloat one by one onto the sea after the candle inside each lantern has been lit. During the TOHRO-NAGASHI, the skies are filled with colorful firework displays, which are reflected on the surface of the bay adding to the extremely beautiful scene of the floating lanterns. The scenery is so beautiful that some of the visitors cannot stop weeping and repeating Nichiren prayers with clasped hands. 280 years ago, on November 22, the 16th year of Genroku, over four hundred Kominato villagers lost their lives in one night because of a large Tsunami caused by a great earthquake which hit the entire area of Boso (present Chiba prefecture). As a memorial of this disaster, the head priest of the Tanjoh-ji Temple, Daichu-In-Nikkoh-Shohnin (26th) made a large image of Buddha and all secular and posthumous Buddhist names of the victims were written down and placed within. From then till the outbreak of World War II, a Memorial Service was held every month on the 22nd, the anniversary of their death. After the war, this memorial service was expanded to include war victims and was transformed into the UMI-SEGAKI-RYUTOH-E (Memorial service of TOHRO-NAGASHI) of today at TAI-NO-URA. The festival became more and more prosperous every year. Today, more visitors, not only from the Tokyo-Yokohama area but also from the Kansai (Western Japan) area, come to visit and spend nights in Kominato to participate in the TOHRO-NAGASHI memorial service for ancestors, victims of the sea and land disasters, and spirits of the dead whether they are personally related or not..